Whit Kirtland at Bradford Marine Yacht Sales kindly provides details of his latest listing, the 36.6m motor yacht Lady Diane II. With a hull built in composite by Westport, she was completed by Canada's Sovereign yard in 1998. Accommodation is for six guests in three staterooms including a full beam master suite and she boasts extensive deck areas for entertaining or relaxation, Twin 1800hp MTU engines give Lady Diane II a cruising speed of 16 knots and top speed of 18 knots. 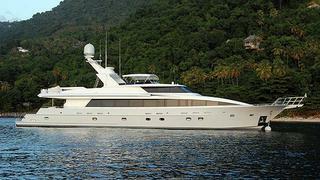 Lying in Fort Lauderdale, Lady Diane II is asking $4.9 million.